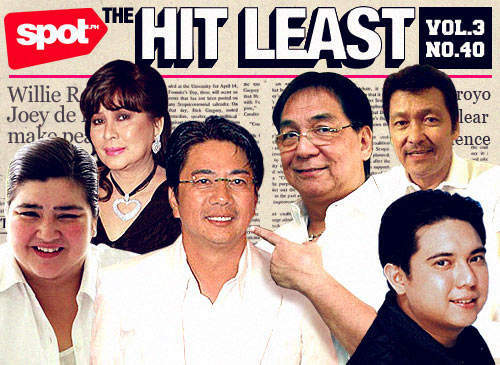 Plus, the MRT can’t be trusted, Annabelle Rama vs Nadia Montenegro, and other baffling events. 1. REP. MIKEY ARROYO AND HIS WIFE ACCUSED OF TAX EVASION, MIKEY SAYS THEY’RE INNOCENT AND THAT HIS CONSCIENCE IS CLEAR. We’re torn between believing you and listening to "Whip My Hair" non-stop for nine years. 2. PARAÑAQUE’S INFORMAL SETTLERS TURN HOSTILE AS EVICTION TEAM MOVES IN. Thanks to this video, we now know that screaming "Matagal na ako rito!" serves as a verbal land title. 3. AFTER BEING HIT BY CRITICS FOR BEING "INVISIBLE," P-NOY VISITS FLOOD-HIT AREAS. Why is it that your people say one thing and then you end up all wet? 4. TEACHERS CITED FOR THEIR SELFLESSNESS ON WORLD TEACHERS’ DAY. Can "Thank you" buy chalk? 6. THE MRT BREAKS DOWN FOR THE NTH TIME. We rest our case. 7. ALJUR ABRENICA TALKS ABOUT BEING SELF-CONSCIOUS IN HIS AMAYA COSTUME. You remind us of those people who eat something they consider sinful and then say, "I’m supposed to be on a diet!" 8. NADIA MONTENEGRO ACCUSES ANNABELLE RAMA OF CHILD ABUSE, THE LATTER (OF COURSE) FIGHTS BACK. Put them in the MMA Octagon and be done with it. 9. WILLIE REVILLAME MAKES PEACE WITH JOEY DE LEON BY GIVING HIM A LOUIS VUITTON BAG. That’s a pretty expensive "peace pipe." 10. SEN. LITO LAPID FINALLY JOINS THE RH BILL DEBATES, AT ONE POINT ASKS IF CONTRACEPTIVES CAN ALSO CAUSE THE BIRTH OF "FOURPLETS." 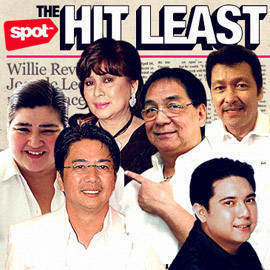 He’s so much fun we briefly considered renaming the lowlights as "The Lito Lapid Chronicles."